Well, I made it to the quilt shop the other night and finished this little guy up. I haven't done a small quilt in a while. 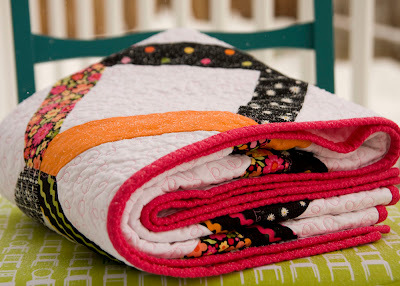 They really are fun, quick and super easy to baste and quilt. While making this one, I took some pictures of the block construction process to give you some tips. I'll post those on Monday. In the meantime, here are pictures of my actual final quilt of the year. That puts me to 20. I'm starting to run out of reasons to make quilts. My mom and in-laws have two quilts each. I gave my husband's siblings quilts for Christmas. I have three siblings left who will receive quilts sometime in the future. 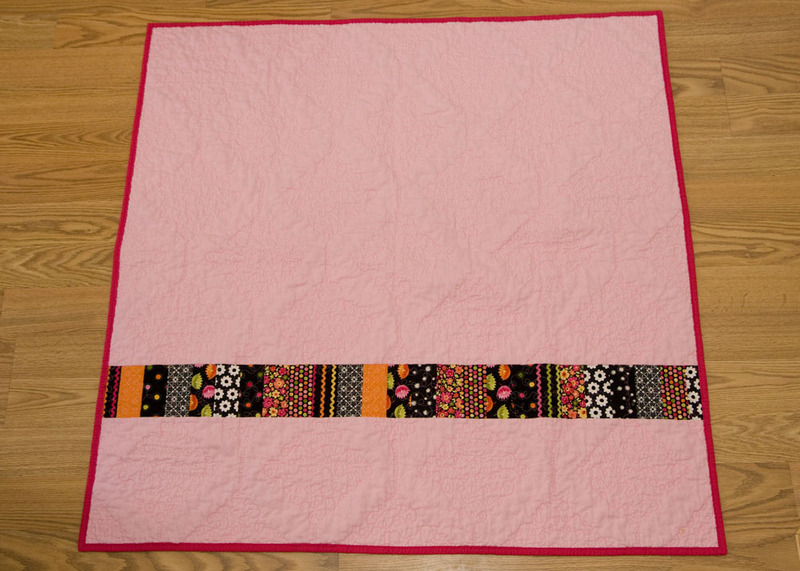 I still need to make a quilt for my youngest, Miss A, and that's about it. I have toyed with the idea of trying to sell some, but I don't know if it would be worth it. Obviously I won't make much, but at least it would support my habit and pay for my fabric addiction. It's been snowing for two days, so I finally just went out and took my pictures in the snow. 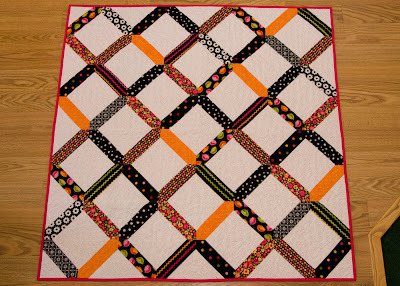 I quilted it using the same pattern as my other lattice quilt. I thought about straight line quilting, but I really like how the loopy quilting comes out. 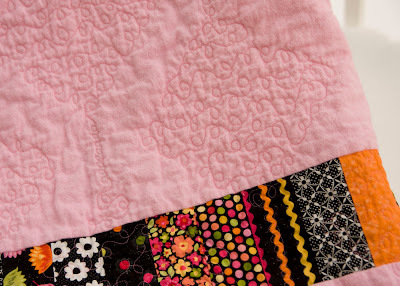 I quilted with a candy pink. I've never done a quilt with a contrasting threat before. I'm still debating if I'll do it again, although I do like it. With all the snow, I didn't have a place to get a full picture of the quilt. I just took these on the kitchen floor. I might get outside and take a few more to replace these, once the snow stops. I tried something new on this quilt. I pieced my batting. I used up my batting stash with all the Christmas quilts I made, but I have oodles of scraps so I decided to try it out. I have an edge-piecing foot for my machine, and that helped so much. It worked out really well. I think I will make a few more Frankenstein bats before I venture to the store for more batting. I'm looking forward to using up my scrap pile and cleaning out that basket. 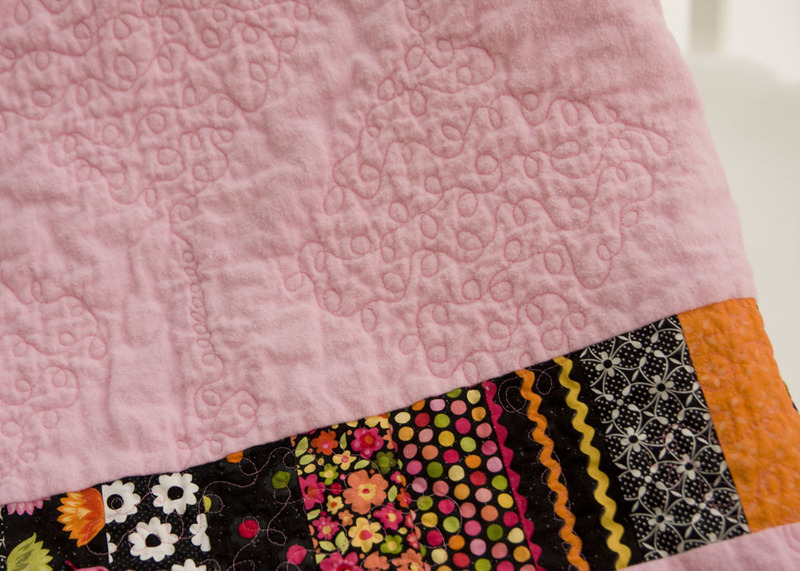 I really like the loopy quilting that you did on this quilt. I really like the entire look of the quilt. Thank you for sharing. 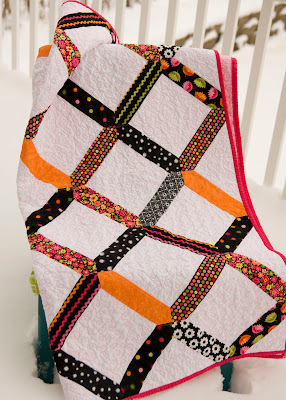 LOVE the colors in this quilt! So unusual and beautiful. I LOVE this!!! I think my favorite part of this quilt is the way the quilting looks on the back. Love this! 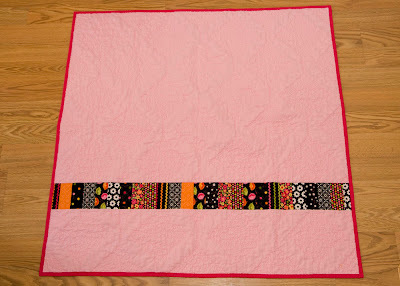 The quilting is perfect! I pieced together some batting too. I always end up with those strange sized scraps! I just butted the two pieces together and zig-zag stitched them together. Worked great! This turned out beautifully! The quilting is fantastic (again) - I love the secondary pattern on the back. And the pink thread! So pretty...I love the contrasting thread and the loopy look! It's good to use what we have and once the batting is inside the quilt...only the maker knows for sure!!! Sew pretty! I have other plans for my batting scraps, but am glad to hear about your piecing it together. I always wondered if that worked. I've pieced batting by butting ends and zig zagging them together. It hasn't been a problem, even after washing a quilt. Beautiful! Way to end 2010 with bang! 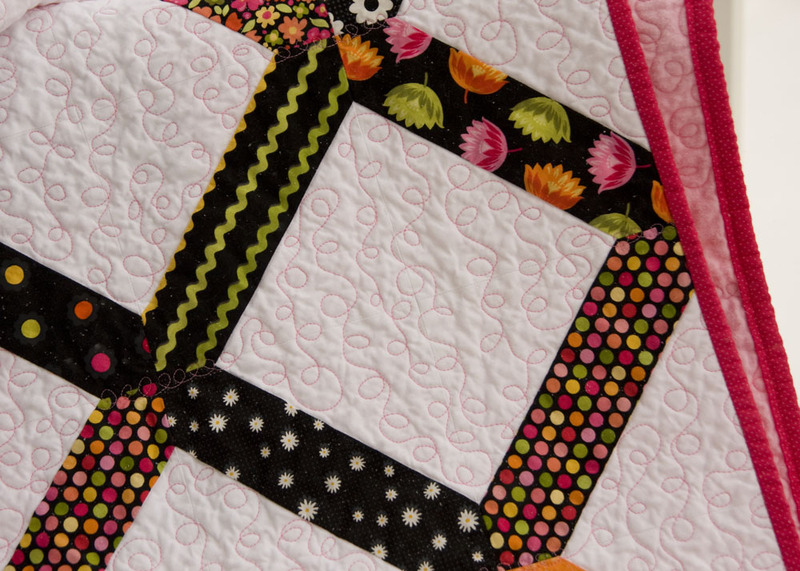 It is gorgeous, and I love your pieced backing! I don't think you need a reason or a specific person to make quilts for, as long as you enjoy the process then go for it, and I am sure down the track the perfect people for those quilts will come along! Very pretty! I usually just stipple when I free motion quilt, but I think I need to try those loops! So so cute, great to hear that piecing your batting worked well, I'm like you, I have oodles of random leftover batting, perhaps I'll give it a try as well! Congrats! You have a very pretty quilt. Those are really beautiful. I'm really amaze.